The long-time US effort to put in place a US friendly government in Venezuela is reaching new aggressiveness and violence under the Trump administration led by National Security Advisor John Bolton, Special Assistant Elliot Abrams and Secretary of State Mike Pompeo. President Trump has openly called for military action since August 2017. 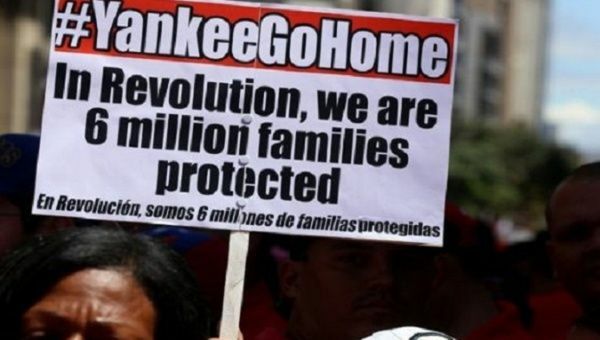 Those opposed to US intervention in Venezuela will be holding a mass protest at the White House on March 30 to kick-of a week of action against NATO and the war against Venezuela. This article was posted on Sunday, March 24th, 2019 at 3:28pm and is filed under Mercenaries, Militarism, President Nicolas Maduro, Sanctions, United States, US Hypocrisy, US Lies, US Terrorism, US War Crimes, Venezuela.